Don’t look now, but after a brief 1% pullback, the S&P 500 is back at the 2000 level! Both the S&P and the Dow closed yesterday within spitting distance of all-time highs. But despite the market’s 0.5% gain over the past five days, many traders are scratching their heads at the red numbers they are seeing in their trading accounts the past few days. What gives? I hate to be the bearer of bad news, but I believe that many of the recent drops have nothing to do with your particular stocks at all. 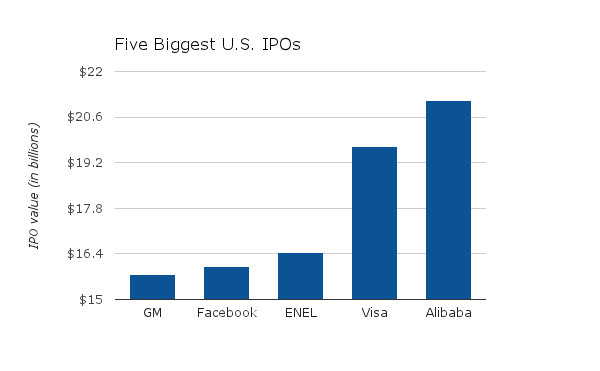 In case you’ve been living under a rock, possibly the largest IPO of all time will be taking place on Friday: Alibaba. Alibaba is expected to raise more than $20 billion in a single day! And that’s just the IPO. If the stock trades higher on Friday, it will be sucking even more money into its market cap from the open market. So the question you should be asking yourself is this: where is that money coming from? First, you need to understand the case for buying Alibaba shares. Let’s start with the comparison I’ve heard countless times about Alibaba: “Alibaba is the Amazon.com of China!” First of all, $2o billion companies can rarely be explained in a single sentence. And here is a wonderful article by Charles Riley explaining exactly why Alibaba is not the the Chinese Amazon. But I like to keep things simple. So despite Mr. Riley’s well-written points, I will operate under the assumption that Alibaba is at least in the same business realm as Amazon. Alibaba is a huge online presence in China. The company claims 300 million customers (the entire U.S. population is about 314 million, by the way), and the growing middle class in China coupled with the relatively poorly structured “brick and mortar” retail infrastructure in China has produced (allegedly) 60% year-over-year revenue growth for Alibaba. So it’s safe to assume that the people buying Alibaba are looking for one or more of this triple threat: technology, big growth, and China. However, it’s also safe to assume that almost all of these investors had stock portfolios long before this week. In other words, I don’t necessarily think Alibaba buyers have been collectively sitting on $20 billion dollars for years and years, desperately hoping for an eventual Alibaba IPO. I ask again: where is the $20 billion coming from? I think at least part of the answer has become obvious this past week or so: investors are raising cash to buy Alibaba by selling other stocks. Just look at Amazon, Alibaba’s closest American analog. While the Dow Jones set a new all-time intra-day high today, Amazon is down about 2% in the past five days. If Alibaba is the Amazon of China, I’m sure plenty of people who own or owned Amazon will want to own Alibaba, and they are dumping shares of Amazon to raise cash. The same can be said for other similar stocks. Look at shares of eBay, another high-growth internet retail company that has been drawing Alibaba comparisons: the stock was down over 2% over the past five full trading days. LinkedIn is another example of a popular high-growth technology play that might have a similar appeal to Alibaba investors: down over 9% in the past five days. Another popular high-growth online-is-the-future-type company is Netflix: down over 6% in the past 5 days. What about Tesla? Maybe it’s not an internet company, but it’s certainly a high-growth technology company whose investors have an eye toward a revolutionary technological transition in the automotive industry. You guessed it: Tesla stock is down more than 7% in the past five days. But since I don’t hold long positions in any of these stocks (I’m short Amazon), I’m going to briefly cover an aspect of this phenomenon that hits closer to home for me. I mentioned earlier that the third prong of the “Alibaba triple-threat” was exposure to China. For U.S. investors, there are a limited number of decent ways to invest in China. One of the biggest ones is owning shares of Baidu. And wouldn’t you know? BIaidu is down about 2% in the past five days. What a coincidence. Unfortunately, this is where it really starts to sting for me. Regular readers of Trading Common Sense and/or Motley Fool are well aware that I am a big believer in diversifying into China. I made that decision way back in 2009 when I bought my shares of Melco Crown Entertainment. Despite the fact that I’m still up over 500% on my shares of Melco, it’s been a rough year for the company. And Alibaba is not helping. The Chinese gaming stock is down over 4% in the past five days. So what is the takeaway from all of this? Alibaba is taking your money!!! But put down the torches and pitch forks. There’s nothing to be done about it. Some of the stocks in your portfolio may be temporarily lagging the surging market because of the “Alibaba Effect.” But the key word there is “temporarily.” In the long run, this massive IPO will have absolutely nothing to do with how these stocks perform relative to the rest of the market. Now, as for how the overall market will perform, that remains to be seen. I plan on making that a central point in tomorrow’s post, so stay tuned! Want to learn more about the dynamics of trading an IPO? Or maybe you just want to be able to look sophisticated in front of your coworkers when they ask you what you are reading on your Kindle, and you’d prefer to tell them “Oh, I’m just reading a book about stock market analysis,” rather than the usual “Oh, I’m just looking at pics of my ex-girlfriend on Facebook.” For these reasons and more, check out my book, Beating Wall Street with Common Sense. I don’t have a degree in finance; I have a degree in neuroscience. You don’t have to predict what stocks will do if you can predict what traders will do and be one step ahead of them. I made a 400% return in the stock market over five years using only basic principles of psychology and common sense. Beating Wall Street with Common Sense is now available on Amazon, and tradingcommonsense.com is always available on your local internet!